I don't mean negligee as a disparagement of McCall 5880, just a descriptor. I think it's fun and has a little retro kick. Cidell came to DC recently so there are some lovely outdoor project photos to look forward to. My new camera has a feature where it will take 3 shots in a row on the self-timer so it's a lot easier to do self portraits now (except that I can't get it to do a red-eye reducing flash and the red-eye feature on iPhoto keeps putting black spots in my hair and leaving my eyes red), but nothing is nicer than having a patient photographer who makes both the clothes *and* me look pretty. I end up with nice shots like the one at right. While getting ready for Spain I crammed in as much sewing as I possibly could. I am forever lamenting the dearth of non-work appropriate clothes in my closet (it makes me feel old and boring that I could meet with my boss in just about every dress I own), and a vacation seemed like a good time to throw a flirty little dress in the mix. I had a flash of inspiration to make up the silk chiffon I got in Hong Kong with AllisonC into this pattern and just *had* to get it done. The next time I think that the only reason I don't like sewing with silk chiffon is that it has to be lined or underlined for opacity, somebody please slap me upside the head. The awfulness of sewing silk chiffon is inversely proportional to how lovely and luxurious it is to wear. Let's start with cutting. You lay it out aligned on grain and the slightest whisper blows it out of place. You pin down the pattern and carefully cut. When you lift your carefully cut piece up, it turns out to have been haphazardly hacked out by a blindfolded kindergartner almost directly on the bias. When you sew the threads snag, even when you are using the finest sharp/microtex needle in your collection, and of course that goes double when you're putting in French seams. And did I mention the seam puckering? Which goes double because you have to sew French seams? Seriously, sewing this stuff is an unfun experience. But then! You put it on! And you decide you can live with the puckered seams and pulled threads and crookedness because look how it flows! Feel how soft! I think I am suddenly a Rich Lady Who Lunches! Who else gets to wear such fabulous fabric? The pattern is cute and easy (just one instruction sheet), perfect to knock out for something to wear on a Saturday night. The pattern is actually designed to be lined, which is great. The skirt is cut in princess lines, which adds little to the design if you don't plan to topstitch. Since I was working with silk chiffon I considered combining the pieces into a single front and back. While I was sewing my puckering, wonky seams I definitely wished I had, although there is such volume and flow that (hopefully) my bad seams don't show. The bodice and skirt are separate pieces and the seam serves as the elastic casing for the empire waist. At first I thought this could be a little tacky looking, and in a heavier fabric it could be but in this fabric the final appearance is not much different than gathering would have been. However, as the pattern illustration suggests, this absolutely must have some sort of decoration at that line. I went with a ribbon tie, tacked on at the center back and sides. The back is designed to have a short zip that stops a couple of inches above the waistline. I changed it because (1) there was no way I was putting a zipper into silk chiffon, and (2) I liked the idea of a split back more--it fits with the style of the bodice front and is a little flirtier. I just sewed the back as for the front and gathered it into the neck binding. I closed the binding with two hooks and eyes because with just one set the ends rotated. I may go in and replace these with snaps because the hooks and eyes are forever coming undone. I put a button on top for decoration. This is such a lovely dress! The fabric is so cool and the color suits you very well. I also like the black bow and ribbon. It's woth all the work! I love silk chiffon really I do! And it makes beautiful dresses as evidenced by your amazing creation...However, the pain and agony of sewing with it can sometimes obliterate the wonderful result. You have luckily managed to trudge through the pain to come out on the other side with a winner! Stunning dress! Very pretty!!! And I think that same blindfolded kindergartener has recently been at work in my sewing room. If I am sewing with anything slippery (and it can be washed) I starch the heck out of it before I cut it. That makes it a little easier to work with, then I just wash it when I am done. That dress looks like it was made for you! Really cute. ah! your dress looks beautiful! I think one valuable tip when sewing chiffon is: starch, starch more, starch again. Ohhh, I love today's dress on you, also the Muse Grecian Dress from Monday. Both suit you very well. Your dress is amazing. It's going on my list. OMG this dress is FANTASTIC on you! The style, the colors, the flowy (and dastardly) silk chiffon. It's perfect! Super cute! I have a few cuts of chiffon in my stash but to date I have never sewn with the stuff. I will keep this post in mind when I finally get around to it. This has got to be my favorite dress on you. Your others are great too, but this seems to be designed just for you! I love the fabric and the print you chose. It looks lovely with your skin and hair! I feel your pain when working with chiffon and other silk like fabrics. You summed it up nicely! Such an adorable dress, and great photos! I am with you with the agony of What Do I Wear to work... not every day to the office, mind you, but to those week long meetings and conferences I end up wearing my two dresses or one work appropriate piece every day. It does get boring! Beautiful dress and fabric! I need to be more daring with my fabric choices! Well, you'd better be lunching in a very overheated hotel for the next few months :-).. Seriously, did you know about stabilizing seams in fine silk? You can buy expensive stuff, or you can do as my grandmother did and use strips of newspaper. You sew the regular way, layering your fabric on top of the paper, then tear off along the seams, and you get no puckers. I promise, I didn't believe it myself but it makes a huge difference. You should still get rid of unnecessary princess seams when you have fabric like that though..
Love it. It really does pop, doesn't it? That fabric was worth all the pain. It really s a lovely dress. Really cute dress, Trena. I have not attempted silk chiffon yet: too scary! Give me predictable fabrics any day, though it is lovely. This dress is adorable on you. Great call about the zipper, the back looks great. I have silk chiffon also that I keep putting off working with. The photos are fantastic. Just gorgeous! You need to wear it again quickly while we still have warm weather here in Washington! Chiffon is a pain to sew, but you DO forget the pain once the garment is done and you get to wear it! It doesn't get any prettier! 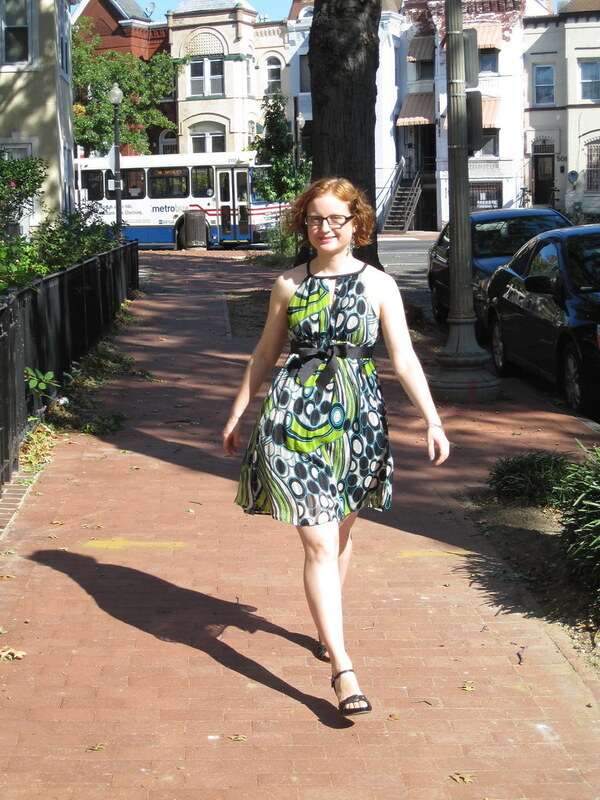 The dress is adorable - it is just the right length on you, and the pictures are great (thanks Cidell!). The colours work so well for you. Darling dress Trena...you will look fabulous in Spain! Hi Trena, Fabulous dress! Everything about it suits you to perfection. I've not yet tried silk chiffon but have recently been working with silk charmeuse which is also very slippery. I pinned it to a sheet of tissue paper then attached the pattern pieces with lots of pins through all layers. I hadn't done this before and was surprised at how much difference it made to the cutting accuracy (photos at http://chaneljacket.blogspot.com/2009/09/my-new-found-love-of-sewing-slippery.html). Cindy from Color By Number had a topical post a day or so ago where her tip is to use wrapping paper instead of tissue and she specifically mentions chiffon. http://colourbynumber.blogspot.com/2009/10/helpful-sewing-tips-week-take-1.html Plus I used a rotary cutting blade instead of scissors (also for the first time) and I think this helped too. Must say again, your dress looks great! Trena I love that fabric - please take me on your next fabric shopping trip abroad. So pretty. I love the split back instead of the zip, very summery. The colour really suits you. I know that the HD designs are meant for a much younger market, but I like them a lot more than my daughters do. I almost bought that pattern yesterday (I did buy 3 dog coat patterns though). I do believe after seeing yours (too cute!!) that I'll head on over and get it tomorrow since it's still on sale!!! However I will not be using chiffon! I would like to remain sane. The dress looks amazing - great style, colors, fit, everything on you!! You did a wonderful job - even with all the slippery issues!! This is so pretty! Beautiful job. I like your back version better, too. You have got to try this trick! Spray starch the b*jsus pit of the silk, then pin everything to a sheet of paper. Cut through the paper and fabric - no more crazy kindergarten hacking! P.S. Your photographer, Cidell, did a fantastic job of showing off both you and the dress. Great photos really do make a big difference. These photos could easily have come from a BWOF or other fashion magazine. Beautiful dress in the fabric you chose. The work was indeed worth it because you look fabulous wearing it. Love these pictures much too. When I first opened this, the only thing I saw was "Hilary Duff Negligee Dress" Ha! Possibly the most random blog title ever. Your dress looks super-comfy. I'm scared of silk chiffon now, though. So pretty! It turned out great; I'm not seeing any irregularities at all. Everything about this dress is working for you! Wow, you are so cute in this. You sewed it beautifully, and the design and the fabric are perfect together. Great looking dress. You are so brave to sew on this fabric!!! You are too cute! I first saw you on Pattern Review site, and was happy to see that you have a blog! I added you to my list, so I can see all the creations you come up with. You inspire me to make something for myself. I usually only sew for my 19 year old daughter. Most of my sewing projects are on my blog. THis dress is so cute! Love the print. THanks for posting your backlog on dresses!